Bond Economics: When Can Yield Curves Fail As Indicators? When Can Yield Curves Fail As Indicators? Although yield curve slopes are very effective indicators for forecasting recessions, they are not infallible. This article discusses some of the reasons why a yield curve inversion can be a misleading recession signal. NOTE: This article is an unedited section from my manuscript on recessions. As an immediate disclaimer, this section follows one in which I lay out an explanation of why the yield curve is an effective indicator (which is a re-write of an article published earlier). This section counter-balances the enthusiasm from the previous analysis. This is not a statement of my personal views about the recent curve inversion; I remain agnostic with respect to recession odds. Much of the discussion is generic, and may not be applicable to the current U.S. situation. Although yield curves (slopes) should be expected to be a useful recession indicator, this will not always be the case. (Once again, I will use “yield curve” as a stand-in for what are more properly termed slopes.) The explanation is that they result from fixed income pricing, and investors trade bonds in order to make money, not provide signals to economic analysts. Anything that puts a wedge between that goal and economic outcomes clouds the signal. One first obvious point is that bond market pricing could be completely unhinged with respect to future outcomes. We cannot expect bond market participants – and by extension, bond market pricing – to be clairvoyants. We are instead assuming that bond market participants have at least a plausible chance of making a correct prediction based on available information. One important potential source of distortion – that cannot be corrected for by a technical discussion of bond market characteristics – is that the risk-free curve is pricing the path of the policy rate. Yield curve inversion is associated with expected rate cuts. The historical experience is that the central bank generally only cuts rates when a recession hits, but this is not always the case. The figure above shows the experience in the United States around the 1998 crisis in the post-1990 period. (I recycled the chart I used last week, with no updates.) We will focus on the experience around the 1998 crisis. 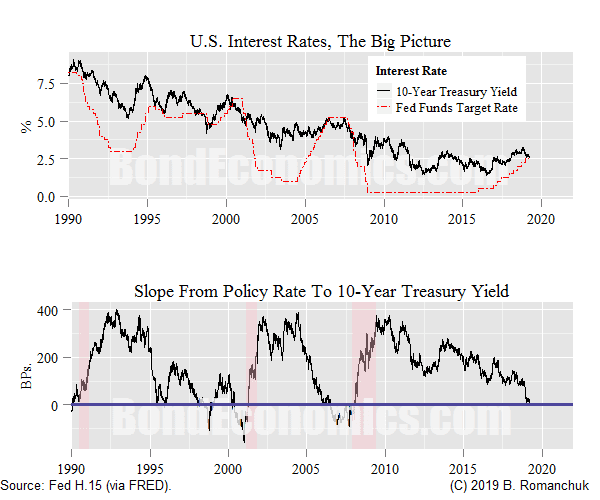 The slope from the Fed Funds rate to the 10-year yield inverted (bottom panel), and this coincided with rate cuts (top panel). Although the move was quickly reversed, bond market participants did correctly anticipate the central bank policy shift. However, the United States avoided recession (the Asian economies were plunged into a deep contraction because of currency pegs breaking, and policies pushed on them by the IMF). In other words, the market was correct about Fed policy (and hence pricing was vindicated), but there was no recession to show for it. If one is charitable towards central bankers, one might expect this to happen relatively often. The central bank senses a softening in the economy, and it snugs the policy rate to counter-act this. Under conventional assumptions about monetary policy, recession should be avoided. As a general rule, the Federal Reserve tends to adjust interest rates incrementally, in a series of small or moderate steps in the same direction. He contrasts this with a more direct approach. An alternative to gradual policy adjustment is what an engineer might call a bang-bang solution , or what I will refer to today as the "cold turkey" approach. Under a cold turkey strategy, at each policy meeting the Federal Open Market Committee (FOMC) would make its best guess about where it ultimately wants the funds rate to be and would move to that rate in a single step. In the abstract, the cold turkey approach is not without appeal: If you think you know where you want to end up (or are at least are willing to make your best guess), why not just go there directly in one step rather than drawing out the process? We can summarise these behavioural patterns as suggesting that central banks will only start cutting rates when something serious hits the economy. They cannot be too forward-looking either: people generally interpret central bank rate cuts as a signal for recession, and so a downturn in the economy could be self-fulfilling. Therefore, we should not be too surprised that rate cuts tend to happen with a lag after a recession (or financial crisis, as in 1998). Another behavioural tic is the possibility that the central bank might not cut rates at all when a recession hits. This could be the case for a small “technical recession,” or perhaps the central bank could be staffed by hair shirt economists who refuse to cut rates because oil prices are rising (or similar). The next fundamental issue that affects the interpretation of the yield curve is the zero lower bound. Since money (e.g., currency in circulation) pays a 0% rate of interest, it was commonly argued that interest rates could not go below 0%. However, we do have experience with bonds trading at negative yields. For simplicity, I will put aside that reality, and first discuss the situation for yields observing a hard bound at 0%. 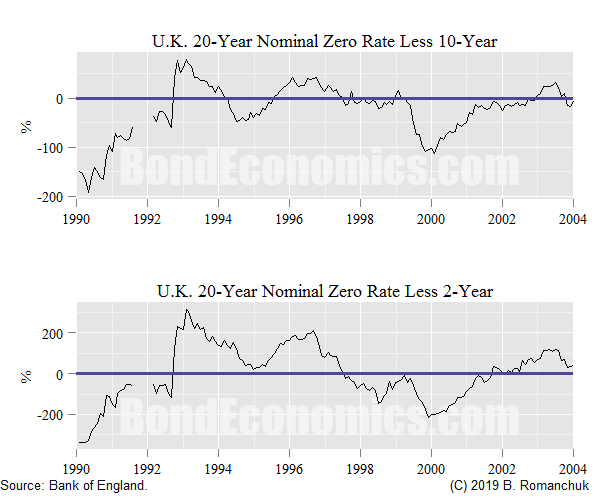 If all interest rates are bounded below by 0%, and the policy rate is at 0%, it is clear that we cannot observe an inversion of bond yields relative to the overnight rate. Furthermore, holding bonds at low nominal yields is unattractive. This was famously observed by Keynes in his discussion of the “liquidity trap” in Chapter 15 of the General Theory. (Post-Keynesians typically complain about mainstream economists misusing the term to refer to the policy rate hitting 0%.) However, modern fixed income pricing theory offers an even uglier picture for low-yielding bonds than Keynes suggested. One of the basic results of option pricing is put-call parity. (I apologise to readers that unfamiliar with option pricing.) An at-the-money put should have the same price as an at-the-money call. This is because we can buy a call and sell a put (at the money) to create a synthetic forward contract. The cost to enter a forward is zero, hence the net price for the option position has to be zero (modulo bid-offer). For fixed income options, the path for at-the-money strikes is equal to the path of forward rates. There are strong implications for option pricing. If the forward rate is 0.1%, the most an option that pays off on a fall in interest rates (either a receiver swaption, or a call on a bond) has a maximum payout based on a fall of 0.1% relative to the strike. This means that the premium has to be quite small. This means that the option that pays off if interest rates rise is very cheap relative to the potential for the rise in rates. Even if we have strong confidence that the short rate will be stuck at zero for a few years, how confident are we about an interest rate forecast five years from now? (This refers back to Keynes’ notion of fundamental uncertainty.) If that forward rate is near zero, the options market is going to give us nearly free options to hedge that uncertainty. Therefore, so long as you think that the zero bound will hold, you need to be crazy to drive longer-term (e.g., 10-years) too close to zero, as Japanese Government Bond (JGB) investors found out the hard way in 2003 (below). The Japanese experience with the Zero Interest Rate Policy (ZIRP) conforms to the above description. 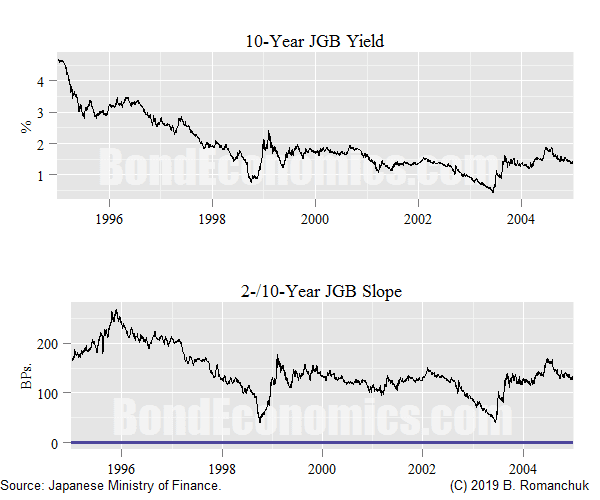 As seen in the top panel, for most of the 1998-2005 period, the 10-year JGB yield generally stayed between 1-2% (with the previously noted downward excursion in 2003). This kept the 2-/10-year slope positive, and relatively steep when compared to other developed countries at the time. (The relatively high positive slope in the JGB market was the bane of investors who shorted them versus other markets – particularly the Australian market – on the theory that interest rates should converge based on equilibrium considerations.) This is despite the recession that hit in 2001 (based on the declining GDP definition). .) During the period shown, there were no widespread expectations for the possibility of negative interest rates (which arrived later). Adding in the possibility of negative rates complicates the discussion, but the result is qualitatively similar. The possibility of hoarding currency, or using the contractual right to pay bills early, will limit how far negative interest rates can go. This means that probability distributions are still skewed in a positive direction, and so we should expect the slope to be similarly sticky with a positive bias. The next point of slippage is the issue of credit risk. If we look at curves where there is a credit risk – such as euro area sovereigns – curves may invert as a result of default fears. This inversion does not really tell us anything about the path of the policy rate. The mechanics of inversion are straightforward. When an issuer defaults, bonds have a recovery rate that is some fixed percentage of the par value. This means that all bonds of the issuer will trade at the same price, which is at a discount to par. In order for a short duration bond to have the same price as a long duration bond, it has to have a much greater rise in yield. Hence, short-dated yields are higher than long-term, and the curve tends to be downward-sloping. One may note that the concerns about credit risk are somewhat academic, particularly if we confine ourselves to slopes between central government liabilities. If there is a fiscal crisis, one would not be surprised if fiscal policy tightening led to a recession. However, if one is working with private sector credit curves, it may be that the financial marker disruption is too localised to trigger a recession. The last area of concern would be technical issues within the bond market affecting pricing relative to the expected path of short-term rates. This could all be lumped under the topic of the term premium. (The term premium is a risk premium that presumably added by fixed income investors to the expected path of short rates to determine the fair value of bond yields.) A later article will discuss the topic of using affine term structure models to adjust slopes to take into account a modelled term premium; the remainder of this section will discuss less systematic analysis. Rather than discuss a formal notion of a term premium, I will phrase the issue as: can supply and demand affect fixed income pricing so that slopes offer misleading information about the consensus forecasts of bond market participants for the path of short rates? It is clear that this can happen, but it is unclear how significant these effects are. One initial technical issue is the question of using benchmark bonds. Benchmark bonds can quite often trade at a lower yield than older bonds with similar maturities. This used to be an issue for U.S. Treasury benchmarks, as the bonds could sometimes be financed in the repo market much cheaper than off-the-run Treasurys (“trading special” versus “general collateral rates”), which justifies a premium in pricing. For countries with less liquid bond markets, there can be jumps in yields if the quoted benchmark bond changes. The usual way to deal with these problems is to use a fitted curve. However, this can pose new risks, particularly for maturity points that are near the endpoints of the set of fitted bond maturities. Another technical issue revolves around banking system rates. There can be high demands for liquidity around year-end (or fiscal year end), and short-term bank rates can spike for tenors that cross the year-end date. Within the money markets, there is a variety of instruments, each normally trading at relatively small spreads (for example, under 25 basis points) to each other. There can be technical issues that cause wider divergences, and so choosing an inappropriate instrument may give a misleading reading for short-term rates. For example, many entities (trusts and similar) have large cash balances that exceed bank deposit insurance limits, yet they are not allowed to take credit risk. These entities are essentially forced into the Treasury bill market. As a result, a reduction in supply can cause the Treasury bill curve to decouple from other risk-free curves, such as the government bond term repo curve. The previous factors that affect quoted yields are technical, and could be diagnosed by market practitioners aware of these distortions relatively easily. Moreover, the distortions tend to only amount to 25 basis points or so. The more difficult question is whether supply and demand factors can the bond curve more significantly. The question then arises: how widespread are such distortions? My argument is that for most markets, the 10-year maturity (at least) should be relatively free from extreme distortions due to supply and demand mismatches. The private sector has no difficulty in providing a supply of 10-year bonds, and to an extent, duration is fungible. This is not the case for 30-year bonds, as credit analysis on such a horizon is awkward for most businesses. However, if we look at places like Australia (which unusually ran central government fiscal surpluses for an extended period), even the 10-year tenor may have been pushed around by supply/demand mismatches. That previous argument was qualitative, and probably will not satisfy many readers. A later article will discuss the use of affine term structure models to generate term premia estimates algorithmically – and which raises new issues. In summary, the bond market is pricing the path of the policy rate. It is possible that rate cuts – signalled by an inversion – may not be a necessary and sufficient condition for a recession. Furthermore, factors in the bond market can lead to a distortion in the yield curve relative to the unbiased forecasts of market participants.